How Much Was Bank Regulation Weakened in the New Budget Bill? And What Can Be Done Now? In a rare, late-night and weekend, session, the US Senate on Saturday night passed a $1.1 trillion government funding bill to keep the government running through to the end of fiscal year 2015 (i.e. until September 30, 2015). The House had passed the bill on Thursday, and it has now gone to Obama for his expected signature. Had it not been passed, the government would once have been forced to shut down due to lack of budget authority. It was a “must-pass” bill, and as such, was a convenient vehicle for a number of provisions which stood little chance to pass on their own, but which could only be blocked by opponents now at the cost of forcing a government shutdown. The specific provisions included were worked out in a series of deals and compromises between the leadership of the Republican-controlled House and the now Democrat-controlled (but soon to be Republican-controlled) Senate. One such provision was an amendment to the Dodd-Frank Wall Street reform bill, originally passed in July 2010, which enacted a series of measures to strengthen the regulatory framework for our financial sector. The failure of this framework had led to the 2008 economic and financial collapse in the last year of the Bush administration. The amendment in the new budget bill addressed just one, and some would say relatively minor, provision in Dodd-Frank. But its inclusion drew heavy criticism from liberal Democrats, led by Senator Elizabeth Warren of Massachusetts. Senator Warren argued that the amendments to Section 716 of Dodd-Frank would “would let derivatives traders on Wall Street gamble with taxpayer money and get bailed out by the government when their risky bets threaten to blow up our financial system.” The amendments were reportedly first drafted by lobbyists for Citibank, and would benefit primarily a very small group of large Wall Street banks. The amendments do reflect a backwards step from the tighter controls on risk that Dodd-Frank had provided for. In my view, it would have been better to have kept the original provisions on the issue in Dodd-Frank. But with a positive response now by the regulators to the reality of this new provision, the impact could be negated. This blog post will discuss what was passed, what could be done now by bank regulators to address the change, and the politics of it all. The amendment to Dodd-Frank addresses one specific provision in a very large and comprehensive bill. An important link in the 2008 financial collapse was the risk major banks had carried on their books from certain financial derivative instruments. “Derivatives” are financial instruments that derive their price or value from the price or value of some other product. For example, oil derivatives derive their value from the price of oil (perhaps the price of oil at some future date), foreign exchange derivatives are linked to foreign exchange rates, credit default swaps are linked to whether there is a default on some bond or mortgage or other financial instrument, and so on. Derivatives can be quite complicated and their pricing can be volatile. And they can lead to greater, or to reduced, financial risk to those who hold them, depending on their particular situation. For example, airlines must buy fuel to fly their planes, and hence they will face oil price risk. They can hedge this risk (i.e. face reduced risk) by buying an oil derivative that locks in some fixed price for oil for some point in the future. An oil producer similarly faces an oil price risk, but a bad risk for it is the opposite of what the airline faces: The oil producer gains when the price of oil goes up and loses when it goes down. Hence both the airline and the oil producer can reduce the adverse risk each faces by entering into a contract that locks in some future price of oil, and derivative instruments are one way to do this. Banks will often stand in the middle of such trades, as the buyer and the seller of such derivative instruments to the airlines and the oil producers (in this example), and of course to many others. Derivatives played an important role in the 2008 collapse. As the housing bubble burst and home prices came down, it became clear that the assumptions used for the pricing of credit default swaps on home mortgages (derivatives which would pay to the holder some amount if the underlying mortgages went into default) had been badly wrong. Credit default swaps had been priced on the assumption that some mortgages here and there around the US might go into default, but in a basically random and uncorrelated manner. That had been the case historically in the US, for at least most of the time in the last few decades (it had not always been true). But this ignored that a bubble could develop and then pop, with many mortgages then going into default together. And that is what happened. Dodd-Frank in no way prohibits such derivative instruments. They can serve a useful and indeed important purpose. Nor did Dodd-Frank say that bank holding companies could no longer operate in such markets. But what Section 716 of Dodd-Frank did say was that banks that took FDIC-insured deposits and which had access to certain credit windows at the Federal Reserve Board, would not be allowed, in those specific corporate entities, also to trade in a specifically defined set of derivatives. That list included, most notably, credit default swaps that were not traded through an open market exchange, as well as equity derivatives (such as on IBM and other publicly traded companies) and commodity derivatives (such as for oil, or copper, or wheat). The bank holding companies could still set up separate corporate entities to trade in such derivatives. Thus while Citigroup, for example, could set up a corporate entity owned by it to trade in such derivatives, Citibank (also owned by Citigroup), with its FDIC-insured deposits and with its access to the Fed, would not be allowed to trade in such derivatives. That will now change. It is also worth highlighting that under Dodd-Frank, banks with FDIC-insured deposits could still directly trade in such derivatives as interest rate swaps, foreign exchange derivatives, and credit default swaps that were cleared through an organized public exchange. That had always been so, and will remain so. The banks could also always hedge their own financial positions. But they will now be allowed to trade directly (and not simply via an associated company under the same holding company) also in the narrow list of derivative instruments described above. So why do banks (or at least certain banks) want this? Banks with FDIC-insured deposits and who also have access to certain credit windows at the Fed, are seen in the market as enjoying a degree of support from the government, that other financial entities do not enjoy. The very largest of these banks may be viewed as “too-big-to-fail”, since the collapse of one or more of them in a financial crisis would in turn lead to a financial cataclysm for the country. Thus depositors and other lenders are willing to place their money with such institutions at a lower rate of interest than they would demand in other financial institutions. Thus Senator Warren and others charge that the amendments to Dodd-Frank “would let derivatives traders on Wall Street gamble with taxpayer money and get bailed out by the government when their risky bets threaten to blow up our financial system”, as quoted above. To be more precise (and less eloquent), any bank with FDIC-insured deposits will make investments with those deposits, those investments will have varying degrees of risk, and if there is a threat that they will fail, the government may decide that it is better for the country to extend a financial lifeline to such banks (as they did in 2008) rather than let them fail. The amendments to Dodd-Frank will allow these banks to invest in a broader set of derivative contracts directly (rather than only at the holding company level) than they could have before. Thus they could end up investing directly in a riskier set of assets than they could have before without this amendment, and all else being equal, there could then be a higher risk that they will fail. Finally, it should be noted that the amendments to Dodd-Frank will benefit largely only four very large banks. The most recent quarterly report from the Office of the Comptroller of the Currency indicates that just four big banks (Citibank, JP Morgan Chase, Goldman Sachs, and Bank of America) account for 93% of derivative contract exposure among banks (as of June 30, 2014). While this figure includes all types of derivatives, and not just those on the list that is at issue here, it is clear that trading in such instruments is highly concentrated. C. What Can Be Done Now? Over the objections of Senator Warren and others, the amendments to Section 716 of Dodd-Frank have been passed as part of the budget bill. Banks, and in practice a limited number of very large banks, will now be able to take on a riskier set of assets on their balance sheets. But Dodd-Frank, and indeed previous bank regulation, has established a bank regulatory and supervision regime that requires that banks hold capital sufficient, under reasonable estimates of the risks they face, to keep them out of insolvency and an inability then to repay their depositors. The bank regulatory and supervision framework was clearly inadequate before, as the 2008 collapse showed. Dodd-Frank has strengthened it considerably. The specific rules are now being worked out, and like all such rules will evolve over time as experience dictates. The amendments to Section 716 of Dodd-Frank will now change the set of risks the banks will possibly face. I would suggest that now would be a good time for current Fed Chair Janet Yellen, or one of the other senior bank regulators heading up the process or even President Obama himself, to make a statement that they will of course follow the dictate of the law (as spelled out in Dodd-Frank, as it still stands) to take into account these possible new risks as they work out the capital adequacy ratios for the banks that will be required. Specifically, the statement should make clear that the capital ratios required of banks that trade in these newly allowed instruments will now have to be set at some higher level than would previously have been required, due to the higher risks of such assets now in their portfolio. It could and should be made clear that the law requires this: The regulators are required to determine what the capital ratios must be on the basis of the risks being held by the banks in their portfolios. How much higher the capital ratios will need to be will depend on the riskiness of these new assets compared to what the banks previously invested in, and how significant such new assets will be in their portfolios. It is quite possible that faced with such higher capital requirements, the banks that had pushed for this new latitude will decide that it would be wiser not to enter into those new markets after all. They may well come to regret that they pushed so strongly for these amendments to Dodd-Frank. This is perhaps not the best solution. The prohibition on direct trading in the proscribed list of certain financial derivative instruments is cleaner and clearer. Most importantly, while current bank regulators may use their authority to ensure banks hold sufficient capital to reflect the greater risk in their portfolio, there is the danger that regulators appointed by some future president may not exercise that authority as wisely or as carefully. This was indeed the fundamental underlying problem leading up to the 2008 collapse. The Bush administration was famously anti-regulation, and Bush appointed officials who were often opposed to the regulations they were in office to enforce. In at least some cases, the officials appointed who were not even competent to carry out their enforcement obligations. For example, Bush famously appointed former Congressman Christopher Cox as head of the SEC. The SEC at the time had the obligation to regulate investment banks such as Lehman Brothers, Goldman Sachs, and Morgan Stanley. As Lehman Brothers collapsed, with worries that Goldman Sachs, Morgan Stanley, and others would soon be next, Christopher Cox was at a loss on what to do, and was largely by-passed. Dodd-Frank changed regulatory responsibility (the Fed and other financial regulators are now clearly responsible, where Goldman Sachs and Morgan Stanley had already been “encouraged” to become formal banks and as such subject to Fed oversight), but there is the risk that some future president will choose, like Bush, to put in place figures who either do not believe in, or are not capable of, serious financial supervision and oversight. In addition, financial crises are always a surprise. They occur for some unexpected reason. If they were expected, actions could be taken to address the causes, and they would not happen and hence not be observed. But surprises happen. Hence Dodd-Frank, and indeed all financial regulation, includes an overlapping and mutually reinforcing set of measures to try to ensure crises will not occur and that banks will not become insolvent should they occur. One does not know beforehand which of the regulatory measures might be the critical one for some future and unforeseen set of circumstances leading to a crisis. it is therefore wise to include what others might call redundancies. The amendment to Dodd-Frank will remove one of the possibly redundant measures to ensure bank safety. The remaining measures (e.g. the capital adequacy requirements) may well suffice to address the safety issue, but in cases like this, redundancy is better. While the economics may suggest that the change resulting from the amendment to Dodd-Frank need not be catastrophic if regulators respond wisely, and hence that the amendment is not such a big deal, the politics might be different. The biggest concern is that many see this as possibly the opening round of a series of amendments to Dodd-Frank and other laws identified with the Obama administration, that a Republican Congress and now Senate will push through on “must-pass” legislation such as budget bills. Particularly if this had slipped through quietly, with little public attention until after the bill had been passed, the bankers and their Republican representatives could have seen this as a model of how to pass changes to legislation that would not otherwise have gone through. While the model is certainly not a new one, its affirmation in this instance would have strengthened their case. The loud objections by Senator Warren and others has served to bring daylight to the changes in financial regulation being proposed. This will hopefully make it more difficult to push through further, possibly much more damaging, changes to Dodd-Frank at the behest of the banks. Ensuring attention was paid to the issue also served to make clear who in the House and the Senate are in fact in favor of bank bailouts. Weakening Dodd-Frank will increase the likelihood (even if only marginally so) that bank bailouts will be necessary in some future crisis to protect FDIC insured deposits and to protect the economy from a full financial collapse. Republicans, including in particular Tea Party supported Republicans, have asserted they are against bank bailouts. But their actions here, with the Dodd-Frank amendments inserted into the budget bill at the insistence of the House Republican leadership, belies that. The actual economic substance of the Dodd-Frank amendments might therefore be limited, especially if there is now the regulatory response that should be required in the environment of certain banks holding more risky assets. But the politics may be quite different, and could explain why there was such a vociferous response by Senator Warren and others to this ultimately successful effort to weaken a provision in Dodd-Frank. Government spending continues to fall under Obama. As this blog has noted in earlier posts, the fiscal drag from this reduction in demand for the goods and services that unemployed workers could have been producing can fully explain why the recovery from the 2008 has been so slow. As another blog post noted, if government spending had merely been allowed to grow under Obama at the same pace as it had historically, the economy would by now be back at full employment. The public debt to GDP ratio would also be lower, as GDP would be higher. And if government spending had been allowed to grow as it had under Reagan, we would likely have returned to full employment by 2011. Fiscal drag is therefore important. Yet it is still not yet commonly recognized that government spending has been falling in real absolute terms for the last several years (and even more so when measured as a share of GDP). Earlier blog posts have reviewed this. The trends have unfortunately continued and indeed strengthened over the last year. Whether this will now change with government spending finally leveling off, and perhaps even start to recover, remains to be seen. The budget compromise for fiscal years 2014 and 2015 reached by Senator Patty Murray and Congressman Paul Ryan in December, and passed by Congress in January, will reverse part of the impact of the budget sequester. According to calculations by the Committee for a Responsible Federal Budget (fiscal hawks in favor of budget cuts), the agreement for FY2014 will lead to a small (1.8%) rise in nominal terms in budget authority compared to the FY2013 post-sequester levels. This would still be flat to negative in real terms, based on inflation of about 2%. And the FY2014 sum would still represent a 3.7% fall compared to what the FY2013 pre-sequester levels would have been. Possibly more important would be government spending at the state and local level. This was cut back as a result of the 2008 collapse and slow recovery, due to lower revenues and the requirement in many states and localities of a balanced budget. While expenditures were still falling in 2013, revenues have started to grow (due to the positive, though still slow, recovery of GDP) and state and local budgets as a result can now start to recover as well. But it also remains to be seen if that will happen. This blog post will update the government spending figures during the Obama term through the fifth year of his administration. 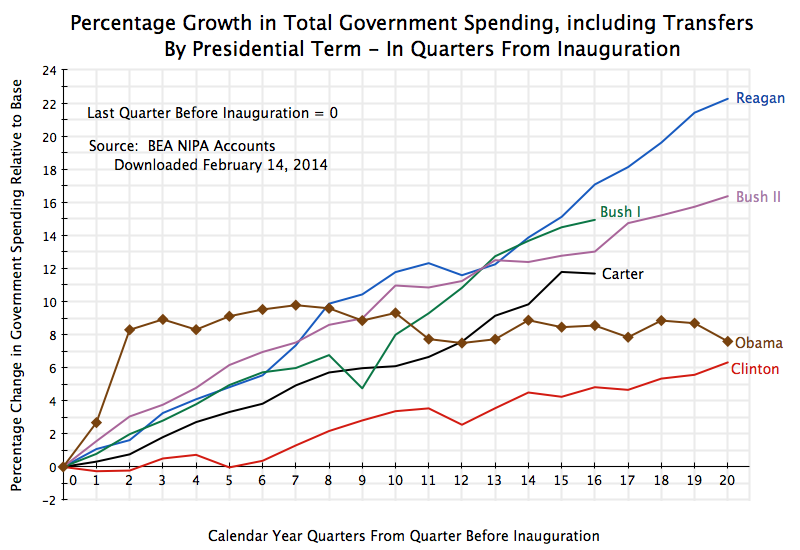 And it will present the figures from a different perspective than before, by tracing the paths during the course of each presidential term (going back to Carter’s) relative to what the spending was at the start of their respective presidencies. 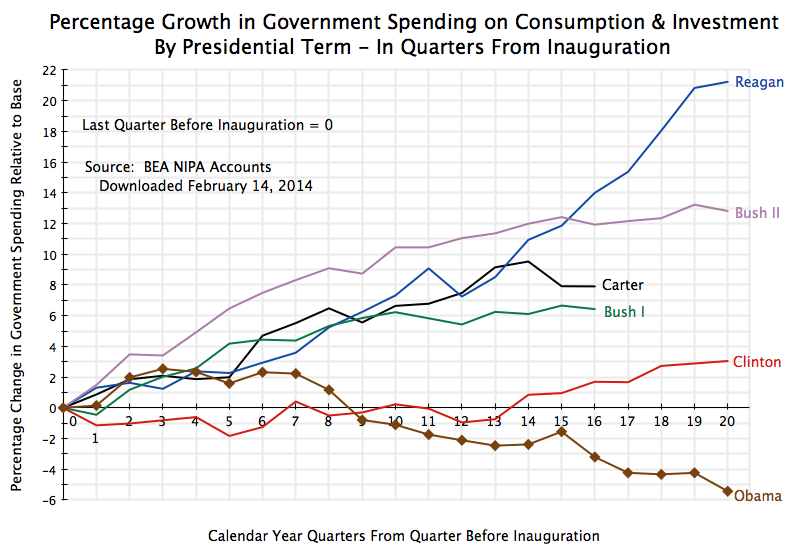 The graph at the top of this post shows the tracks of real government spending on consumption and investment during each presidential term going back to Carter, as a ratio to what it was at the start of their terms. The base period is always taken as the last quarter before their inauguration (i.e. in the fourth quarter of the calendar year preceding their January 20 inauguration). The data is computed from the figures in the standard National Income and Product Accounts (NIPA accounts, also commonly referred to as the GDP accounts) of the Bureau of Economic Analysis (BEA) of the US Department of Commerce, and are seasonally adjusted. Note that all levels of government are included here – federal, state, and local. We will examine below spending at the federal level only, as well as spending including transfer payments. This government spending has fallen by 5 1/2% in real terms by the end of the fifth year (the 20th quarter) of Obama’s term in office. It rose by 2 1/2% during Obama’s first year, which one might note is similar to the increases seen by that point under Carter, Reagan, and Bush I, and with a significantly greater increase by that point under Bush II. Spending during Obama’s term has since been falling steadily, leading to the fiscal drag referred to above, to a point where it is now 8% lower in real terms than it was in his first year, or a net 5 1/2% fall from when he took office. 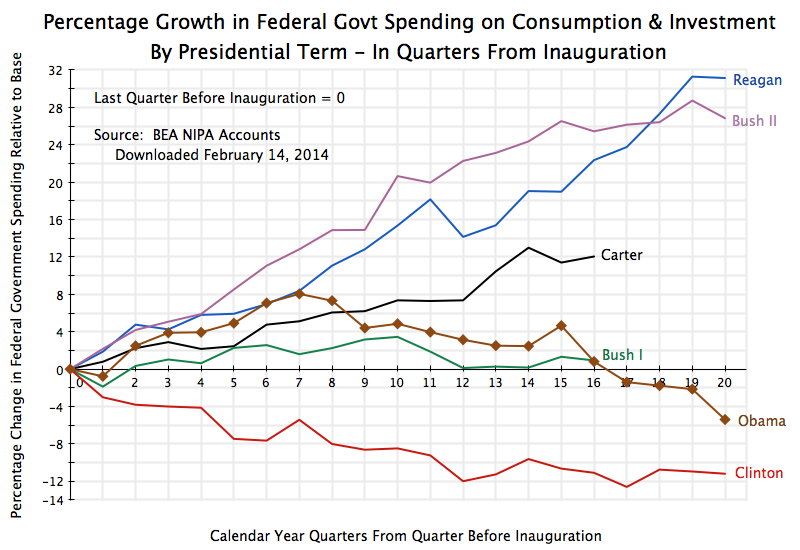 There has been no such fall in government spending under any other presidential term since Carter. The closest was spending during the Clinton period, but there was still a 3% rise by the end of his fifth year in office. The increases by the end of the fourth year under Carter and Bush I (single term presidencies) were 8% and 6 1/2% respectively. And the increases by the end of the fifth year in office were 13% during the term of Bush II, and by a full 21% in real terms under Reagan. Government spending also continued to grow under Bush II and Reagan, reaching increases of 21% and 33% respectively by the end of their eight years in office. Yet Reagan and Bush II are seen as small government conservatives, while Obama is deemed by conservatives to be a big spending liberal. The facts simply do not support this. Government spending for the direct purchase of goods and services (used for consumption or investment), reviewed above, is a direct component of GDP demand. When there are substantial unemployed resources (as now), such government spending will have a significant positive impact in spurring economic expansion. As was discussed in an Econ 101 post on this blog, under such circumstances the fiscal multiplier will be positive and high. Hence the fiscal drag from the cut-back in government spending during Obama’s term in office has kept the recovery below what it would have been. But there is also government spending on transfers to households (such as for Social Security, food stamps, or unemployment insurance). Such transfers are ultimately spent by households for their consumption of goods and services (or will in part be saved, including through the pay-down of debt such as mortgage debt). It will enter into GDP demand by way of the spending of households for consumption, and the impact on GDP will depend on the behavior of households in deciding what share of those transfers they will spend or save. The economy was losing 800,000 jobs per month at that time, pushing the unemployment roles up rapidly and plunging the incomes of many in the population to levels where they qualified for food stamps. Government spending including transfers therefore rose by almost 9% by the third quarter of 2009, and reached a peak of 9.8% in the third quarter of 2010. Since then, however, total government spending including transfers has been modestly falling, and is now 7 1/2% above where it was when Obama took office. Only during the Clinton period did one see a modestly smaller increase, of about 6 1/2%. But there was a 16 1/2% increase in such spending at the same point in the term of Bush II, and an increase of over 22% under Reagan. It was also higher by the end of their fourth years in office for both Carter and Bush I. The differences are not small. What matters to the economy when demand is inadequate and unemployment is high is spending at all levels of government. Yet while we commonly blame the president in office for the performance of the economy, they at best can only influence the federal budget (and influence it only partially, as Congress decides on the budget). Hence it may be of interest also to examine the paths of only federal government spending. The initial increase in federal spending was in part due to the stimulus package that served to restart the economy (GDP was falling from 2008 through the first half of 2009; it then began to recover). Note that while federal spending rose by 8% by the third quarter of 2010, overall government spending (including state and local) rose only by 2 1/2% at that point. State and local government was cutting back, as they were forced to do by the balanced budget requirements of many of them, so federal spending and the stimulus it could provide was partially being offset by their cut-backs. But after this initial increase in the first two years of the Obama presidency, federal spending has been cut substantially, to the point where it is now 5 1/2% below in real absolute terms where it was when Obama took office. Federal spending also fell during the Clinton term, by 11% at the same point in his term. 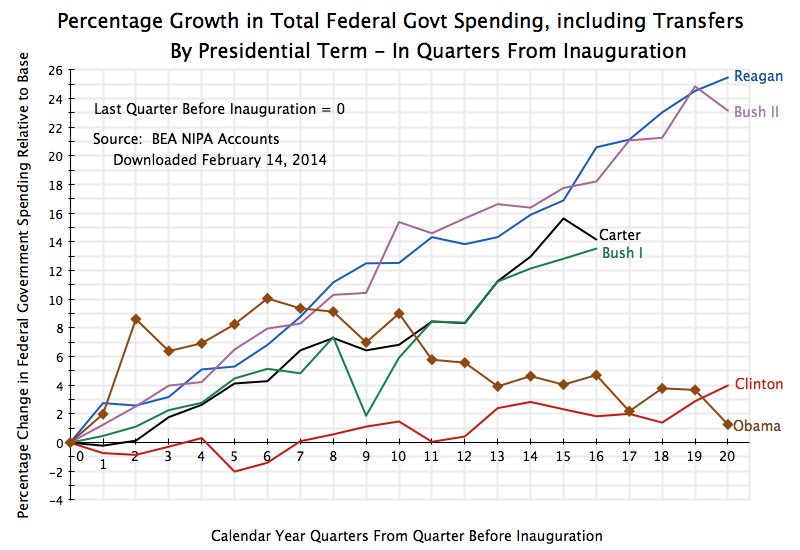 In contrast, federal spending rose sharply under Bush II (by 27% at the same point) and especially under Reagan (by over 31%). Such spending is now lower under Obama than under any of the presidencies examined, including Clinton. Federal spending including transfers rose to a peak in 2010 of 10% above where it was when Obama took office, but has since declined to just 1% above that level. It was 4% higher at that point in Clinton’s term, 23% higher at the point in the term of Bush II, and 25 1/2% higher at that point in the term of Reagan. Republicans in Congress and conservatives generally continue to criticize Obama as being responsible for runaway government spending. But after an initial modest increase in the first two years of his term, as he sought to stop the economic free fall he inherited on taking office (and succeeded), government spending has come down under any measure one takes. The resulting fiscal drag has held back the economy, leading to an only slow recovery. And the fiscal drag during Obama’s term in office is in sharp contrast to the large increases in government spending observed during the terms of George W. Bush and especially Ronald Reagan. Yet they have been viewed as small government conservatives. Previous posts on this blog (including this older one from 2012) have discussed how the sluggish recovery from the 2008 economic collapse could have been avoided if one had allowed government spending to grow as it had during Reagan’s term. This post will look in more detail at what the resulting path for GDP would have been if government spending had followed the path as it had under Reagan, or even had simply been allowed to grow at its normal historical rate. The 2008 collapse was of course not caused by fiscal actions, but rather by the bursting of the housing bubble, and its consequent impact both in bankrupting a large share of an overly-leveraged financial system and in causing household consumption to fall as many homeowners struggled to repay mortgages that were now greater than the value of their homes. Faced with the high unemployment resulting from this, an expansion of government spending would have supported the demand for output and hence for workers to produce that output. And initially, fiscal spending did indeed grow. This growth (along with aggressive action by the Fed) did succeed in turning around the steep slide of the economy that Obama faced as he took office. But since 2009 government spending has been cut back, and as a result the recovery of GDP has been by far the slowest in any cyclical downturn of the last four decades. This blog post will look at alternative scenarios of what the recovery path of GDP could have been, had government spending not been reduced. Two primary alternatives will be examined. In the first, government spending is allowed to grow from the point President Obama took office at a rate equal to its average rate of growth over the period 1981 to 2008. 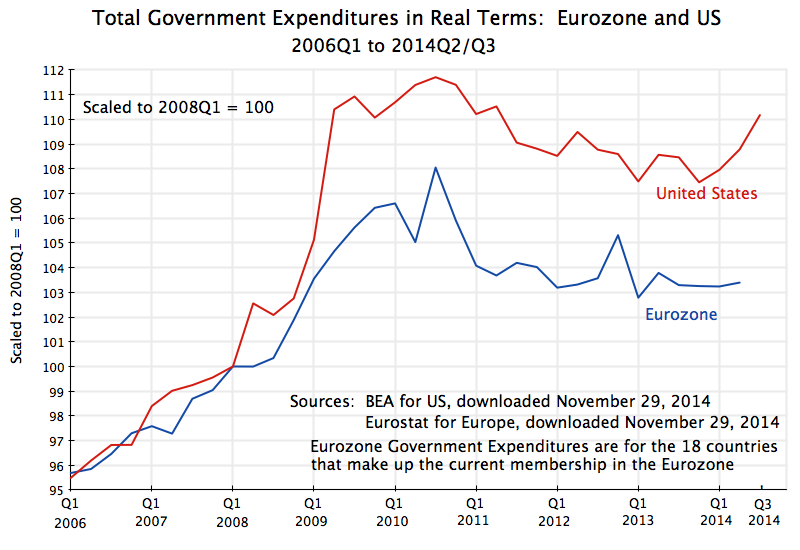 In the second, government spending is allowed to grow from the onset of the recession (i.e. from the fourth quarter of 2007) at the same rate as it had during the Reagan years, following the downturn that began in the third quarter of 1981. In the first scenario, real government spending on goods and services (as measured in the GDP accounts, and inclusive of state and local government as well as federal) is allowed to grow at a rate of 2.24% per year. This is the average rate of growth for government spending over the 28 years from 1980 to 2008. This was a modest growth rate, and spanned the presidencies of three Republicans (Reagan and the two Bushes) for 20 of the 28 years, and one Democrat (Clinton) for 8 of the 28 years. The 2.24% growth rate was substantially below the growth rate of GDP of 3.04% over this same period (note this is for total GDP, not per capita). As a result, real GDP grew by over 50% more over this period than government spending did. But this modest pace of government spending growth was substantially more than the absolute fall in government spending during Obama’s term in office. Note that this path for government spending is not some special rate faster than the historical average, as would normally be called for in a downturn when fiscal stimulus is needed because aggregate demand in the economy is less than what is needed for full employment. Rather, it is just the historical average rate. This should be seen as a neutral path, with government spending neither purposely stimulative, nor purposely contractionary. Maintaining government spending growth at the historical 2.24% rate would have led to government spending well below that seen during the Reagan years (in the recoveries from the July 1981 and January 1980 downturns), roughly where it was in the recoveries from the November 1973 and March 2001 downturns, and well above where it was in the recoveries from the July 1990 downturn (during the Clinton years) and of course the December 2007 downturn (under Obama). Government spending in the current downturn (the brown curve in the graph) has fallen substantially during the period Obama has been in office. 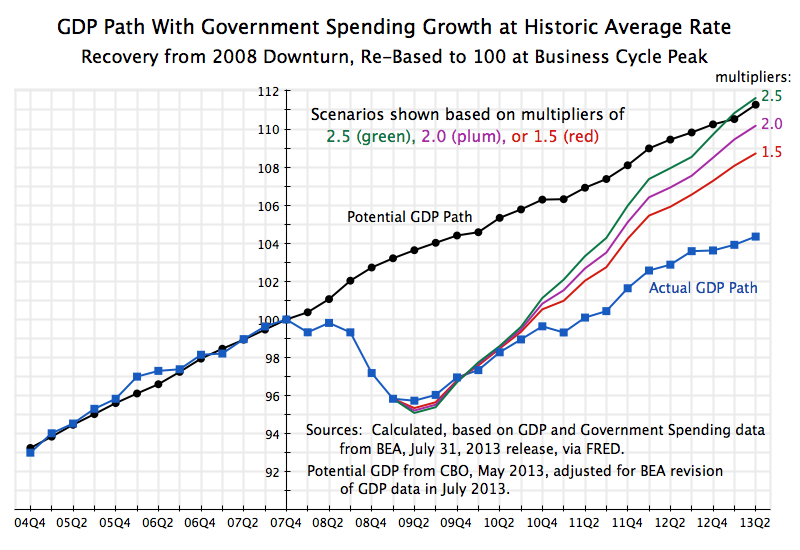 The graph at the top of this post then shows what the GDP path would have been if government spending would have been allowed to grow at the historic average rate. The impact will depend on the multiplier. As was discussed in the earlier post on fiscal multipliers, the multiplier for the US in this period of high unemployment and short-term interest rates of close to zero will be relatively high. But for the purposes here, we will run scenarios of multipliers of 1.5, of 2.0, and of 2.5. This will span the range most economists would find reasonable for this period. Republicans have argued that we cannot, however, afford higher government spending, even if it would lead the economy back to full employment, as it would lead to an even higher public debt to GDP ratio. But as was discussed in a recent post on this blog on the arithmetic of the debt to GDP ratio, it is not necessarily the case that higher government spending will lead to a higher ratio. 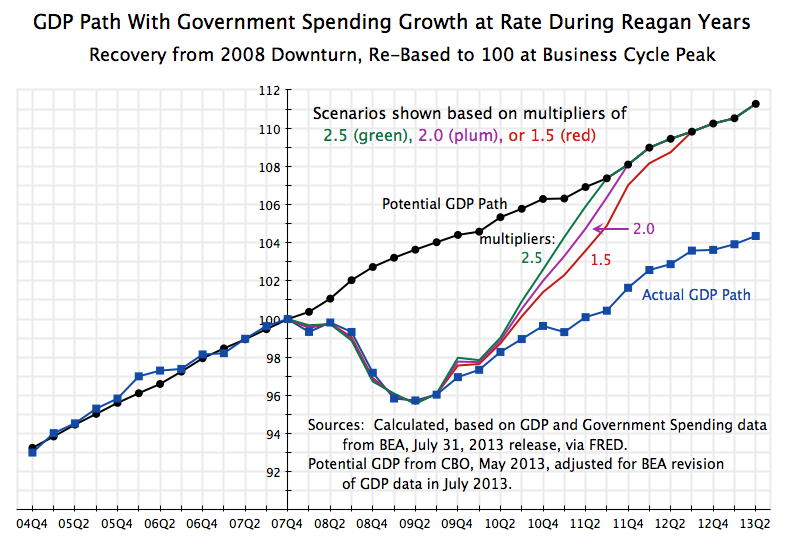 The Republican argument fails to recognize both that GDP will higher (due to the multiplier, and indeed a relatively high multiplier in the current conditions of high unemployment and close to zero short-term interest rates), and that a higher GDP will generate higher tax revenues due to that growth, which will off-set at least in part the impact on the deficit of the higher spending. The impact of the higher government spending is to reduce the debt to GDP ratios over this period. The higher government spending leads to a higher GDP, and this higher GDP along with the extra tax revenues generated at the higher output means the debt rises by proportionately less. The ratios fall the most, as one would expect, the higher the multiplier. If one is truly concerned about the burden of the debt, one should be supportive of fiscal spending in this environment to bring the economy quickly back to full employment. The debt burden will then be less. The debt to GDP ratios still rise over these years. This serves to point out that the assertion made by the Republicans that the public debt to GDP ratio has risen so much during Obama’s term due to explosive spending under Obama is simply nonsense. The debt to GDP ratios rose not due to higher government spending, but primarily due to the economic collapse and slow recovery, which has decimated tax revenues. 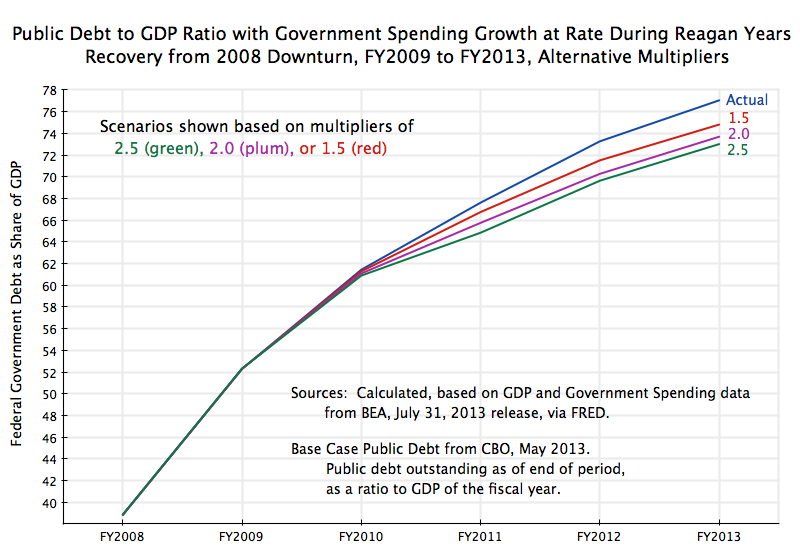 With higher government spending, the debt to GDP ratios would have been lower. The second set of scenarios examine what the path of GDP would have been had government spending been allowed to grow, following the onset of the downturn in December 2007, at the same pace as it had during the Reagan years following the onset of the July 1981 downturn. 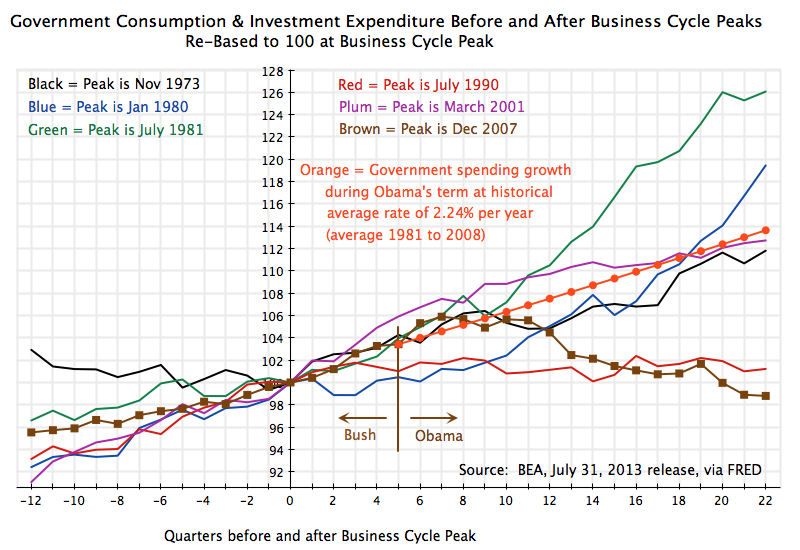 The path followed is shown as the green line in the graph above on government spending around the business cycle peaks. If government spending had been allowed to grow under Obama as it had under Reagan, the economy likely would have reached full employment in 2011 (multipliers of 2.5 or 2.0), or at least by the summer of 2012 (multiplier of just 1.5). That is, the economy would have been at full employment well before the election. Note that for these calculations I assumed that once the economy reached full employment GDP (potential GDP), that government spending was then scaled back to what was then necessary to maintain full employment, and not over-shoot it. Hence the curves for the 2.5 and 2.0 multipliers move parallel to each other (and are close to each other) once this ceiling has been reached. Fiscal spending was not the cause of the 2008 collapse. Rather, the cause was the bursting of the housing bubble, and the resulting bankruptcy of a large share of the financial system, as well as the resulting reduction in household spending when many homeowners found that their homes were now worth less than their mortgages. But following an initial increase in government spending, in particular as part of the fiscal stimulus package passed soon after Obama took office, government spending has been cut back. 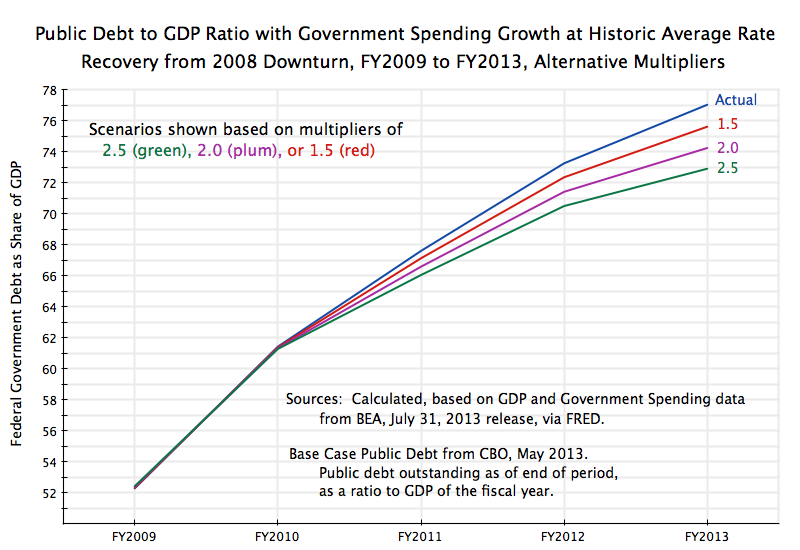 The scenarios reviewed above indicate that had government spending merely been allowed to grow at its normal historical rate from when Obama took office (i.e. 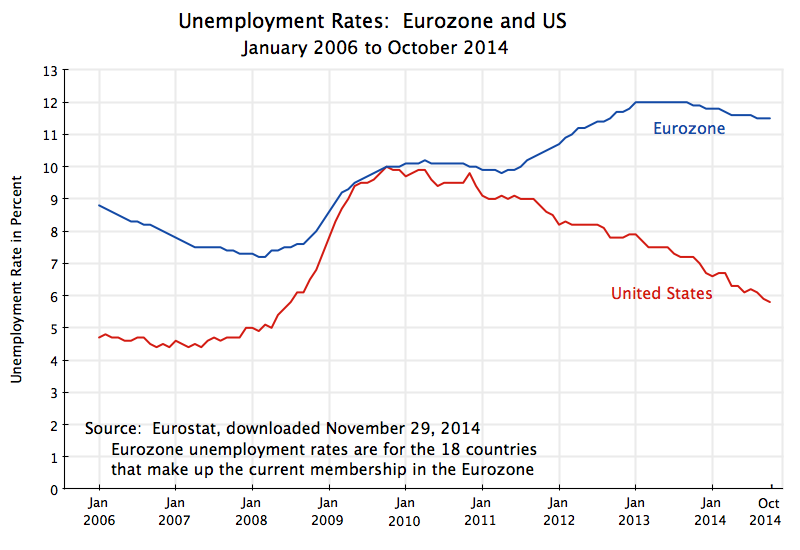 even without the special stimulus package), the US would by now be at or at least close to full employment. And if government spending had grown as it had during the Reagan years, the economy would likely have reached full employment in 2011. There is no need to introduce some special factor to explain why GDP is still so far below what it would be at full employment. There is no need to assume that something such as “business uncertainty” due to Obama, or new and burdensome regulations, have for some reason led to this slow recovery in GDP. Rather, the sluggish recovery of GDP and hence of employment can be explained fully by the policies that have kept government spending well below the historical norms. The recovery from the 2008 economic collapse remains sluggish, with GDP growing in the first half of 2013 at an annualized rate of only 1.4% (according to recently released BEA estimates). And based on fourth quarter to fourth quarter figures, GDP grew by only 2.0% in 2011 followed by just 2.0% again in 2012. As a result, the unemployment rate has come down only slowly, from a peak of 10.0% in 2009 to a still high 7.4% as of July. Conservatives have asserted that the recovery has been slow due to huge and unprecedented increases in government spending during Obama’s term, and that the answer should therefore be to cut that spending. But as has been noted in earlier posts on this blog, direct government spending during Obama’s term has instead been falling. This reduction in demand for what the economy can produce has slowed the recovery from what it would have been. This blog will update numbers first presented in a March 2012 post on this blog, which compared the paths of GDP, government spending, and other items in the periods before and after the start of each of the recessions the US has faced since the 1970s. 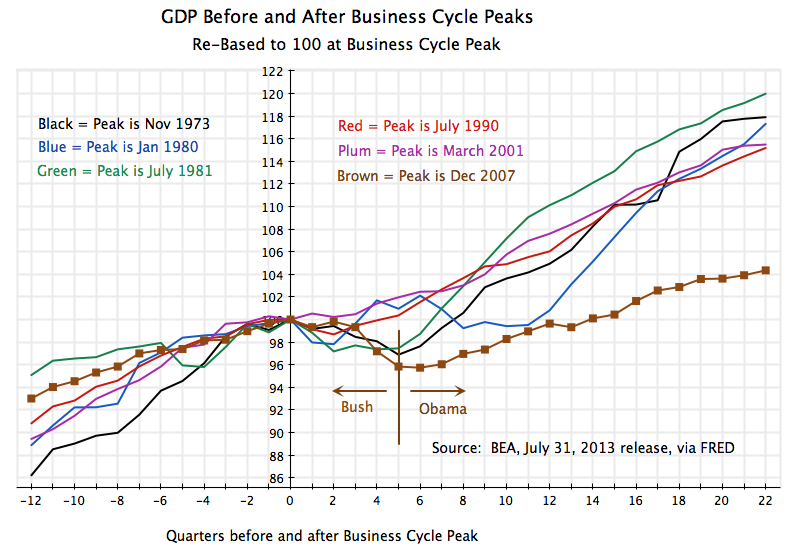 That earlier blog post looked at the paths of GDP and the other items from 12 quarters before the business cycle peak (as dated by the NBER, the entity that organizes a panel of experts to date economic downturns) to 16 quarters after those peaks (when the downturns by definition begin). 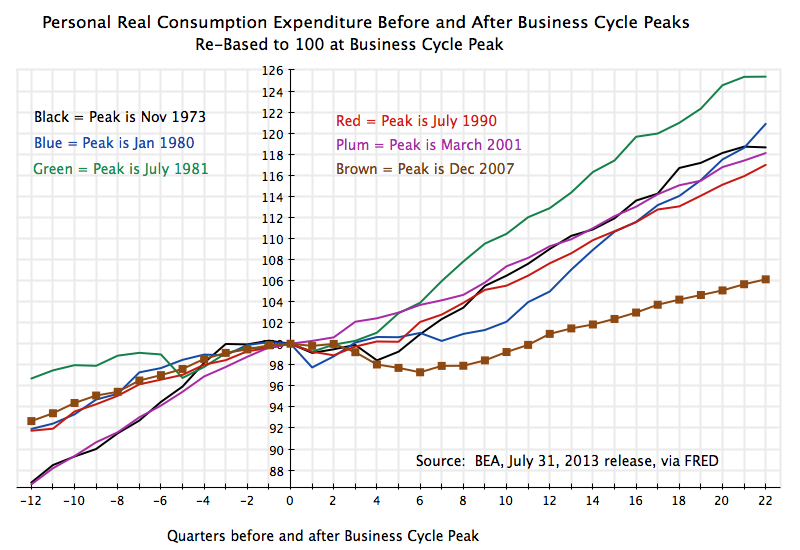 The figures were rebased to equal 100.0 at the business cycle peaks. We now have an additional year and a half of GDP account data, so it is now possible to extend the paths to 22 quarters from the start of the recent downturn in December 2007. This has therefore been done for all. The conclusions from the earlier post unfortunately remain, but are even more clear with the additional year and a half of observations. GDP growth remains sluggish, government spending has fallen by even more, and residential investment remains depressed (although it has finally begun to recover). 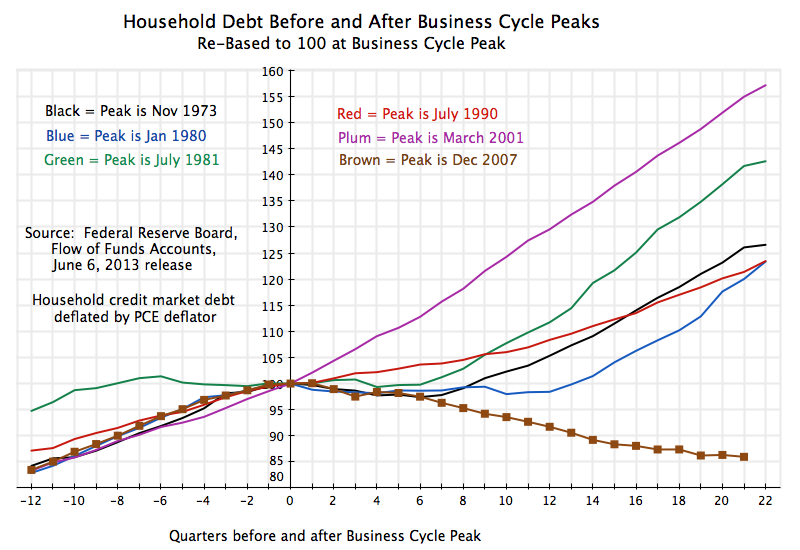 The graph at the top of this post shows the path followed by real GDP in the periods from 12 quarters before to 22 quarters after the onset dates of each of the recessions the US has faced since the 1970s. The sluggish recovery from the current downturn is clear. The economy fell sharply in the final year of the Bush administration, and then stabilized quickly after Obama took office. GDP then began to grow from the third quarter of 2009 and has continued to grow since. But the pace of recovery has been slow. By 22 quarters from the previous business cycle peak, real GDP in the current downturn is only 4% above where it had been at that peak. At the same point in the other downturns since the 1970s, real GDP was between 15% and 20% above where it had been at the previous peak. This has been a terrible recovery. Direct government spending has fallen in this recovery, in sharp contrast to the increases seen in the other recoveries. 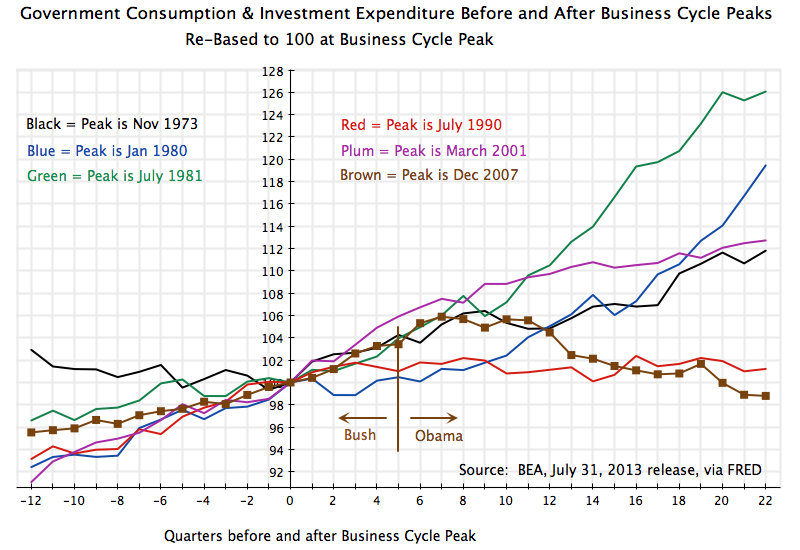 Real government spending was 26% higher by 22 quarters after the onset of the July 1981 recession (the green line) during the Reagan presidency, and 13% higher at the same point in the recovery from the March 2001 recession (the plum colored line) during the Bush II presidency. While both Reagan and Bush claimed to represent small government conservatism, government spending instead rose sharply during their terms. In contrast, in the current downturn direct government spending is now 1.2% below what it had been at the start of the recession in December 2007. Furthermore, it is worth noting that while it rose in the final year of the Bush presidency and then in the first half year after Obama took office (a major reason why the recovery then began), it has since fallen sharply. Government spending is now almost 7% below where it had been in mid-2009, a half year after Obama took office. Such a decline (indeed no decline) has ever happened before, going back at least four decades, as the economy has struggled to recover from a recession. The closest was during the Clinton years, when government spending was essentially flat (a 1% increase at the same point in the recovery). Note that the measure of government spending shown here is that for total government spending on consumption and investment (i.e. all government spending on goods and services). This is the direct component of GDP. Government spending can also be measured by including transfer payments to households (such as for Social Security or unemployment insurance), but as was noted in the earlier blog post from March 2012, the results are similar. Note also that the government spending figures include spending at the state and local levels, in addition to federal spending. While we speak of government spending as taking place during some presidential term in office, the decisions are made not simply by the president but also by many others (including state and local officials, and the Congress) in the US system. But the president at the time is typically assigned the blame (or the credit) for the outcome. The build up of the housing bubble from 2002 to 2006 was unprecedented in the US, and the collapse then more severe. As the graph above shows, there has been a start in the recovery of residential investment from the lows it had reached in 2009 / 2010, but it is still far below the levels seen in previous downturns. Housing had been overbuilt during the bubble in the Bush years, leaving an oversupply of housing once the bubble burst. And while supply was in excess, demand for housing was reduced due to the severe recession. As was discussed in an earlier blog post on the housing crisis, the result was a doubling up of households as well as delays in household formation as young adults continued to live with their parents. 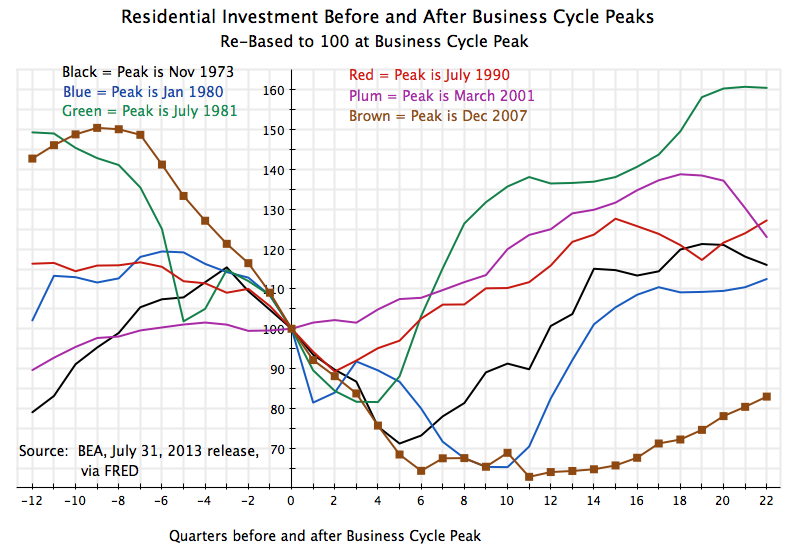 Residential investment therefore collapsed, and has recovered only very slowly. The housing bubble also led to over-indebtedness of households. Nothing of this sort at all close to this scale had ever happened before in the US. With the lack of regulation and oversight of the financial sector during the Bush administration, banks and other financial entities launched and aggressively marketed and sold financial instruments that led to a bidding up of home prices. But these new financial instruments were only viable if housing prices continued to rise forever. When the housing bubble burst, widespread defaults followed. And those households who did not default struggled to pay down the debts they had taken on, for assets now worth less than the size of the debts tied to them. This pay-down of debt had never happened before, and is in stark contrast to the rise in household debt seen in all the other downturns of the last four decades. The difference is stark. Households could spend more in the prior recoveries in part because they could continue to borrow (see the graph on household debt above). In this recovery, households have instead had to pay down the debts they had accumulated in the housing bubble years, and could increase their household consumption only modestly. The recovery in the current downturn has been disappointing. GDP has grown since soon after Obama took office, but has grown only slowly, and has been on a path well below that seen in other recoveries. There are a number of reasons for this. Household consumption has kept to a low path as households have struggled to repay the over-indebtedness they had accumulated during the housing bubble years. Residential investment collapsed as well following the bubble, is only now starting to recover, and remains far below the levels seen at similar points in other recoveries. And government spending has been allowed to fall during Obama’s term. This had never happened before in the previous downturns. Indeed, while real government spending rose by 26% at the same point in the economic recovery during the Reagan presidency, it has been reduced by over 1% in this recovery (and reduced by 7% from what it had been a half year after Obama took office). The reduction in government spending reduced the demand for what the economy could have produced. In this it was similar to the reduced demand resulting from lower residential investment or lower household consumption expenditure. All these reductions in demand reduced GDP, reduced the demand for workers, and hence increased unemployment. But while residential investment and household consumption can only be influenced indirectly and highly imperfectly by government policy, government has direct control over how much it spends. That is, government can decide whether to build a road or a school building, and doing so will employ workers and will lead to an increase in GDP. Hence government spending is a direct instrument that can be used to raise growth and employment, should the government so choose. Sadly, and in stark contrast to the sharp increase in government spending during the Reagan period that spurred the recovery to the 1981 downturn, US politics during the Obama presidency have instead led to a cut-back in government spending, with a resulting drag on growth. The disappointing consequences are clear.